For months I saw rumors online that this might happen. Well it IS going to happen. Eddie Murphy will star and help produce “Coming To America 2.” And this is great news ladies and gentlemen. I am not going to lie, I have watched the original movie maybe 50 or 60 times. No lie. I have watched no other movie more than I have watched the original “Coming To America”. The movie came out in 1988. Of course it starred Eddie and Arsenio Hall. The movie also included other actors such as John Amos, the great James Earl Jones and Sheri Headley. Word is all of them will be coming back for the new movie!! Writer Kenya Barris (black-ish), will be writing the script for the new movie. Amos will again play “Big Mick”, don’t get it confused with “Big Mac”. Amos told TMZ his “McDowell’s don’t get it confused with McDonald’s, would sell zebra and hippo burgers in the new movie. Murphy of course will play African Prince Akeem in the new “Coming To America 2.” The new movie will follow Akeem as he returns from Zamunda to the U.S. to re-connect with his estranged son, the heir to the throne. Brewer just worked with Murphy on “Dolemite Is My Name” starring Eddie as Dolemite. That movie is suppose to be off the chain! Word is production of the new “Coming To America 2” will start sometime this year. Arsenio Hall will be bringing back his character “Semmi” and Shari Headley will again play Lisa McDowell, the love interest who Akeem courts in the original movie. The first movie was so funny and I STILL laugh when I watch the original movie all the time. I really really do. It is just a funny movie PERIOD and I know the new movie will be also be just as funny. I know it will be. Will comic Louie Anderson come back for new movie we will see. 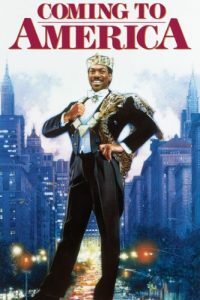 Remember in the first film, Anderson’s character worked at McDowell’s and finally got promoted to assistant manager “where the big bucks start coming in.” We will keep you informed here on “Music Inner City News Magazine” on new information about the new “Coming To America 2.” starring Eddie Murphy. Cannot wait to see it!! Wendy Williams Goes In On Terrence Howard!